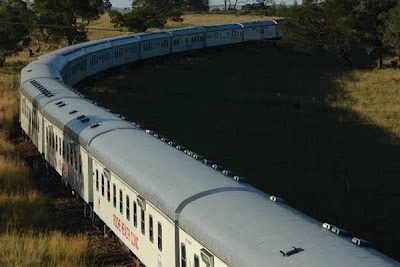 Maximizing Progress: Healthcare Train ~ South Africa's Phelophepa! Thanks to Railways Africa piece Second Healthcare Train Launched for describing the Phelophepa Healthcare Trains! It's so obvious and brilliant and great once you hear about it, but I had no idea that this exists till just now! "On the introduction of Phelophepa II, public enterprises minister Gigaba says: “What started off 18 years ago as a modest three-coach eye clinic has become an internationally well-known beacon of hope, providing healthcare throughout South Africa, especially in rural areas. [...] Each train has 20 permanent staff, 16 contracted security officials and 40 students on board. They function as training institutions for South African and international final-year professional health students, not only providing practical experience for nursing, dental, optometry, psychology and pharmaceutical students, but also attracting catering students needing an opportunity to practise their skills."